When a heavy crawler machine changes direction, the lateral warping stress made by its turn is so severe that it causes damage to the road surface. The dispersion of such warping stress from the metal blades is the central concept of clip on rubber pad structural design. The protective rubber firmly bonds itself to the metal core which in turn provides mechanism for its fixture onto the tread board. GTW Clip on rubber pad segments are the original and the best protective rubber segments in the market to date. GTW supply Brand new rubber pads to suit all model of excavators and steel track widths. The rubber pads protect road surfaces and reduce noise. 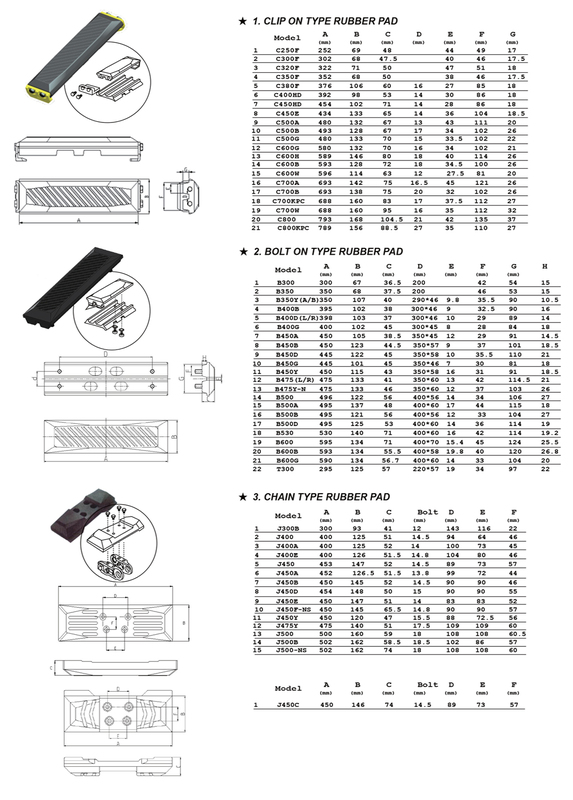 The rubber pads have excellent stability and easy attaching or detaching. The GTW clip on Pad is quickly attached to the Grouser plate without pre bored bolt holes. GTW appreciate the need to be flexible when choosing the correct Pad configuration for your machine. Our service professionals can help you choose the best option for you.